Historically, many different cultures have decorated weapons and armors all over the world. 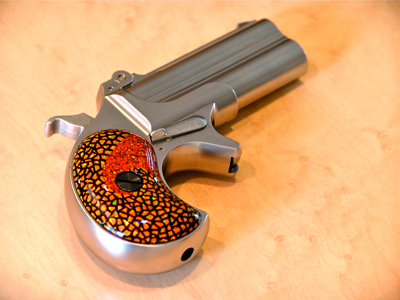 By painting the grip of the depicted pistol using the traditional Japanese lacquer painting technique called “Urushi” we hope to continue the culture of decorating weapons. Based on the universal philosophy that “tools that achieve the apex of function deserve to be appreciated for their beauty” we aim to create new and innovative forms of Urushi. 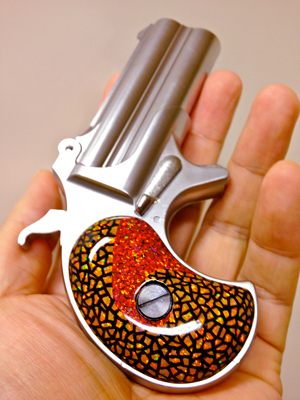 In Japan, the home of Urushi, guns are illegal and in countries where guns are legal there is no tradition of Urushi. By fusing these two cultures we create a new experience based on our traditional crafts that you can appreciate and enjoy. In decorating this work, we used our original technique called “Saikiko”. Saikiko is a technique that combines the profound gloss of Urushi and the glitter of Kyoto Opals to create a dangerous appeal. We hope that by beautifying this weapon we can inspire people to appreciate its beauty rather than using it for destructive purposes. *NOTE: Kyoto Opal is a product of the Kyocera Corporation.